It's interesting that, while the Grendel/Argent relationship was the absolute center of this original series, it got sidelined a bit in Devil by the Deed. It was still there, but it was less important than the mythic status of Grendel and his all too human relationship with Stacy. I can't wait until you get to Grendel and Argent's rooftop discussion. That was the absolute highlight of the first volume for me. Part of that decision to shift focus may be due to the fact that Devil by Deed originally appeared as short back-ups in the Mage Hero Discovered (or I could be mistaken, just a thought). Given their unusual relationship, it's interesting to think that Argent may have been special to Hunter, a worthy foe to speak of, one of the few to whom he could relate to on some level. 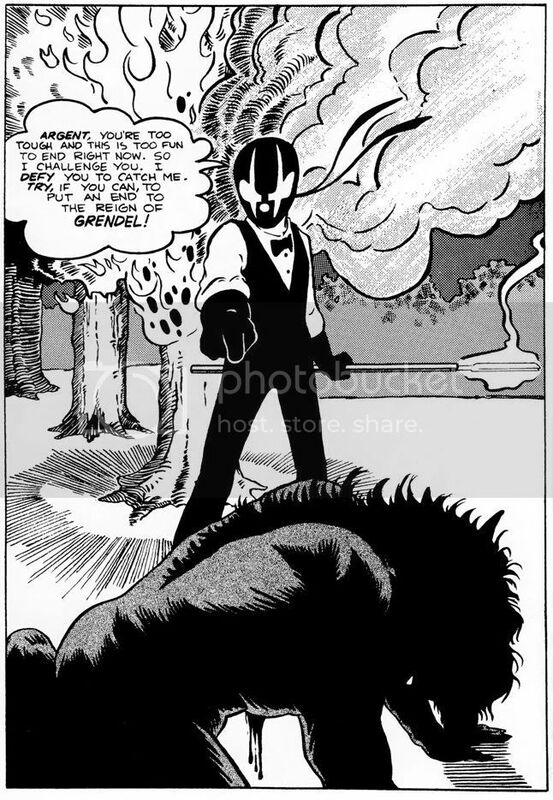 Back in '89, Wagner along with William Messner-Loebs did Silverback, a 3 issue mini that detailed Argent's past and early connections to Grendel. I have yet to read it though and to my knowledge, it's never been reprinted. The influence of Jocasta cannot be underestimated. The stories upcoming in the Black, White & Red various anthologies present this better but before meeting her, Eddie seemed bored, bereft of purpose and challenge. Fencing was an outlet but he soon mastered it and his opponents. His affair with Jocasta opened his eyes and his aspirations which were eventually released by her later death. Taking her surname showed her immense contribution to his outlook and purpose of life. I really appreciate the reviews of this initial mini. I've never read any of it and while I can kinda understand Wagner's views on this very early work, it's fun to see snippets of the original and the core essences that were already present that he would later refine in Devil by Deed. The thing that I always found interested is an off-hand comment made in the series years later, that when researching Grendel's diaries, nobody could find anything about Jocasta; there was no female trainer on the British fencing team that matched Grendel's description. I don't think Wagner ever got more into that, but it raised some very interesting questions. Fascinating. I did not know this. Sat down and read through the Grendel Archives (aka Primer #2 and Grendel #1-3). I had purchased it many, many years ago but hadn't even given it a second thought until this discussion started. I've read so many other Grendel stories, I'm surprised this one slipped through the cracks for me. I really enjoyed it and revisiting the character again (and reading this story for the first time). the tribe's belief in Moglewai subsided and the old gods died out, Argent lived on, forced to live as a fugitive with a thirst for violence raging through his veins. Grendel and Argent then talk about the girl that would bring them together: Stacy Palumbo. That story begins with Barry Palumbo, a real-estate swindler that has connections to both Grendel and Argent. Argent has taken to Palumbo's niece Stacy, a young girl enamored with Argent's furry look. Barry has some tricks up his sleeve, and plans to set both of them up. Meanwhile, a party is being held at the Palumbo estate. Hunter Rose shows up, and Stacy is excited to see him, as they also share a unique acquaintance as well. One of Palumbo's associates claims to work for Grendel, which is news to Rose. The story comes to an end as Stacy goes into Barry's office, only to find Barry dead. And Grendel's not happy. Comments: We get a good look at Argent, with an interesting origin story that is quite different from the norm. Normally I wouldn't think the character idea of Argent would work in this setting, yet somehow he does. Matt Wagner's art style takes another turn here, challenging his artistic expressions in new and different ways. 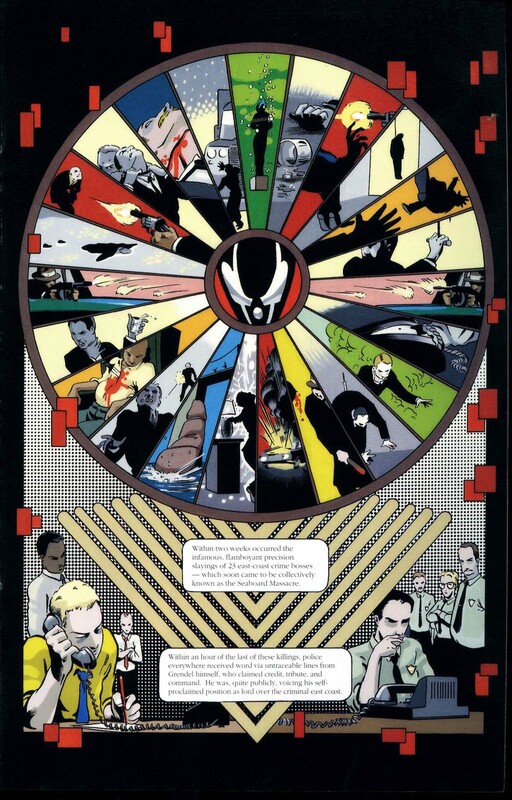 He tells the Argent story by using violent stokes of ink and shadowing to convey the message in several splash pages. This is likely the first of many instances where Wagner will experiment with his art style, and it's quite effective. Synopsis: Stacy Palumbo stares in shock as Uncle Barry lies dead on the floor. Right away Hunter Rose takes Stacy away from the scene. With a maneuver reminiscent of a Vulcan death grip, Rose puts Stacy out and changes into his Grendel costume. Lieutenant Atkins arrives to investigate Barry's death. As Grendel puts in a call for a pickup, Argent strikes. This is the first actual meeting between the two. Lt. Atkins discovers cyanide in Barry's drink and begins to question his family and associates as Grendel and Argent wage battle outside. Argent grabs Grendel's forks and slams him into a wall, then throws the weapon into a tree that catches on fire. Grendel slips away and surprises Argent by jumping out of the tree and tackles him. Lt. Atkins has everyone empty their pockets and discovers cyanide pills in Rachel Coleman's (Barry's girlfriend) purse. While all this is going on a stranger finds a sleeping Stacy on the street and takes her away. Grendel grabs his forks out of the tree and slashes Argent, as Miss Coleman is arrested inside the Palumbo estate. Grendel challenges his new nemesis to a little game, and dares Argent to catch and destroy him once and for all. Grendel then runs to where he left Stacy, only to discover her missing. Comments: It is great to see the first meeting and subsequent battle between Grendel and Argent here. There is a neat juxtaposition happening between the battle and Lieutenant Atkins' investigation nearby. With Barry dead there is a sense that Hunter Rose believes he must protect Stacy at all costs, but Argent doesn't make that easy. Wagner does a good job at portraying the athleticism and skills of both Grendel and Argent in their battle scenes. With everything going on I didn't expect a stranger to just come along and snag Stacy, so that was an albeit creepy surprise. It's too bad it had to end on a cliffhanger, as this was the last fans saw of Grendel until his backup feature in Wagner's Mage series a year later. Stay tuned for Devil By The Deed next. I didn't know this original series ended on such a cliffhanger, that a reader would have to wait over a year to learn who take Stacy (though I love Hunter's reaction to it, both being vexed by the randomness of it interfering with his plans yet exhilarated over this new challenge). I must also admit, the electric forks used by Hunter is one of the coolest and simplest weapon designs in all of comics. Note: This Grendel classic began as a backup story in Matt Wagner's other series, Mage: The Hero Undiscovered from issues #6 to #15. 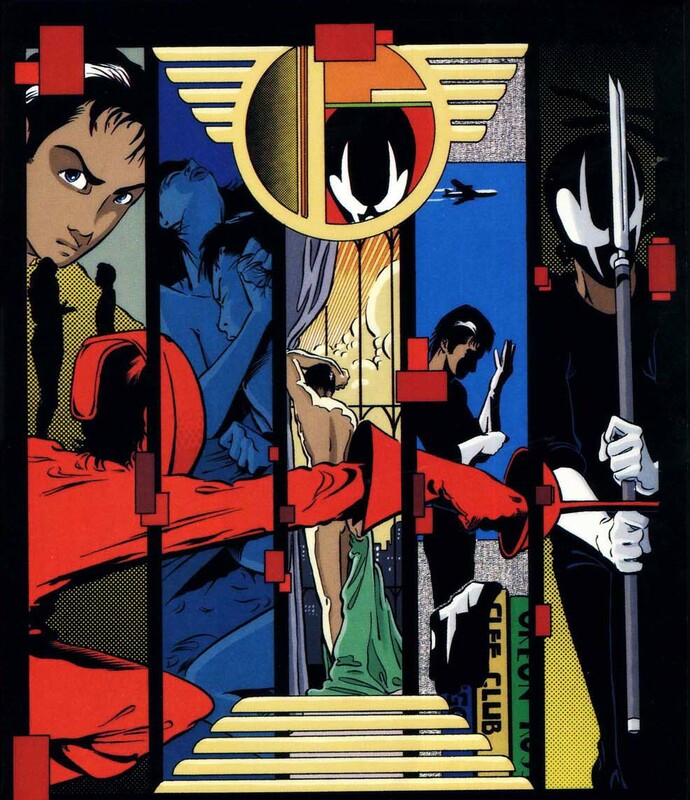 It was later collected into a hardcover graphic novel by Dark Horse. 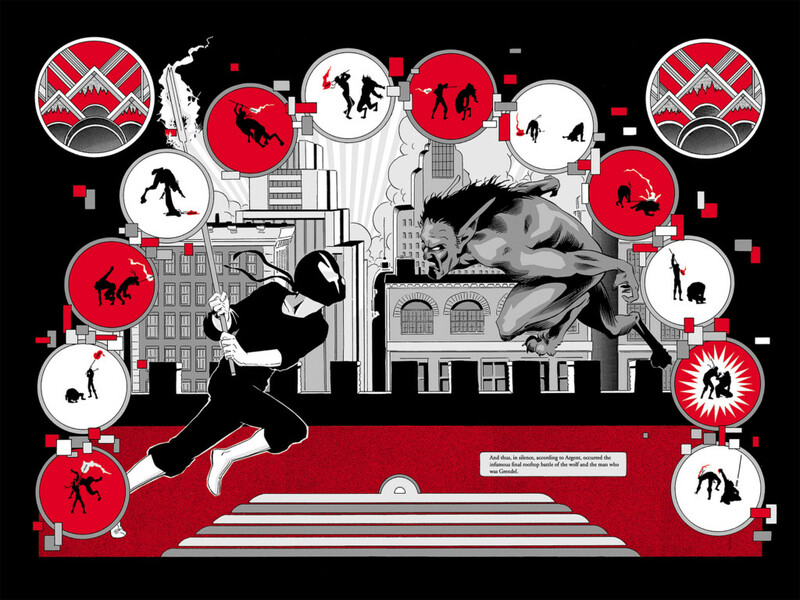 The collected version was also re-colored into only black, white and red colors. I have only read the collected version, but I am curious to know how effective the storytelling and coloring may or may not have been in the serialized version. If anyone has read the original version, I would love to hear your thoughts. leaving her outside near a fountain. We also learn for the first time that it was indeed Grendel that had poisoned Barry, and also planted the cyanide in the purse of Rachel Coleman. Ms. Coleman is sentenced to die by electric chair, and Hunter Rose applies for the legal adoption of nine year-old Stacy, which creates a bit of a media frenzy as he is only eighteen years-old at the time. Rose's new bestselling novel "My Little Chickadee" helped him procure Legal Guardianship of Stacy. Soon after, his thirst for excitement as Grendel has stirred up again. There was an interesting dynamic now that Stacy lived with Rose, as she was also friends with Argent, who would now visit her from time to time. Argent would usually visit Stacy when Rose wasn't around, but Grendel was indeed aware of their meetings. During a skirmish one evening between Grendel and Argent, Argent fell through a rooftop window and suffered a terrible injury, one that was witnessed by Stacy. This traumatized the young girl, and changed the way she viewed her werewolf friend. Although this pleased Rose to no end, Stacy began to withdraw herself in his presence. Grendel's expanding criminal underworld demanded a lot of his time these days, which meant Stacy was left to herself for hours on end every evening at the Rose Estate. She began to become curious about her adopted father, and even more so this Grendel character she read about in the papers. Grendel greatly, and he subsequently calls Argent to arrange the now infamous rooftop meeting. It is there that the two have a nice chat (as seen in Grendel #1-3) before engaging in their epic battle. Argent fatally wounds Grendel, as Grendel permanently paralyzes Argent with the forks. With Grendel dead, and with Argent confined to hospice and disillusioned, Stacy is institutionalized for the next eleven years. She falls in love with her therapist Erik Olliver, and they get married upon her release. But rather horrifically, Olliver rapes his bride and then kills himself on their honeymoon. Stacy is impregnated and gives birth to a young girl she names Christine, but never acknowledges the fact she has a daughter. Stacy instead lapses into insanity and dies in a mental hospital several years later. Christine writes that she has since grown fascinated with the man that was Hunter Rose and Grendel, and the twisted beauty that exists within his secret logs. Comments: First off, it's quite incredible how far Matt Wagner's artistic style had matured in the year since we last saw this character. Brilliant even. I credit his work on Mage as to how he refined his style not only as an artist, but as a writer as well. Wagner's work here is like night and day compared to his Comico work. Where before we were seeing the story played out by an amatuer, now we're witnessing a master at his craft. Wagner's flair for a unique art style is at it's apex here, with nothing but page after page of mosaic-paneled works of art that mesh together in beautiful cohesion. Then there is the writing, which is portrayed in text-heavy panels, cleverly crafted around the art. The way he's weaves the tale in novel format is expertly written, some would even say it's a literal masterpiece. That's not to say that Devil By The Deed isn't rather depressing. Quite the opposite. It's also very dark, and heavily sadistic in nature. It may carry the small essence of a romance, albeit an extremely sad and disturbed one. It's something unlike anything we've seen in comics before, and rarely have we seen anything like it since. This is the definitive Grendel story. I have the original Comico GN of Devil by the Deed. I've yet to read the re-colored version but the difference is night and day. To me, the colors of the original inform and enhance the drama and tragedy of the story, which like you said, is fairly dark. (Consider Stacy's age and what she plots to do and actually does, very unsettling). By altering the colors to just black, white, and red, Wagner seems to be altering the focus of the story and from my POV, it loses some of it's original luster and quality. The coloring is just so beautiful and vibrant, I really can't see myself enjoying this story in the same way nor manner via the re-colored version. And this story is a unique classic. The design and layout of the pages, the coloring, text-heavy yes but it works wonderfully, how Wagner was able to not only condense the original previous story down to a back-up feature but to also finish and complete it, AND have it lead into a brand-new series as well?! Wow, you aren't kidding String. The original version blows the re-color out of the water. I had no idea it looked this good, Comico quality was hit and miss back then but this is amazing. It's a shame that they went with the black, white and red re-coloring when the original looks this good. I'll definitely seek out that original GN now, and thank you for posting this! I own both the original Devil by the Deed GN and the Grendel Omnibus because I honestly can't decide which coloring job I appreciate more. While the original is more vibrant, the recolor creates the sense that this is an oft-retold mythos occurring in the distant past; it is not vivid and alive as the original colors would suggest. Generally, I find myself reading the recolored version more often. Synopsis: Based on an excerpt from Devil By The Deed, Devil's Vagary focuses on the kidnapping of Elizabeth Rosen. The story begins inside one of Grendel's buildings, as a meeting between Grendel and his top associates has taken place. Several topics at hand are discussed, including the recent kidnapping of Elizabeth Rosen. Grendel has her and plans to exchange her for a set ransom, but Samuel Rosen and the police are attempting to arrange an arms deal scam to set him up. The arms deal takes place and Argent attacks, killing Grendel's men. But Grendel knew of the setup all along, as he reveals to Elizabeth Rosen as he unsheathes' his forks. Ms. Rosen would later be discovered sitting in the waiting room of Police HQ, quite dead. Comments: This issue introduces quite a few firsts. This is the first Grendel piece that was penciled by someone else, with Dean Motter handling the artwork. Matt Wagner wrote the issue. This is also the first time we get a good look at Grendel's crime syndicate, including where they meet and how they conduct business, which I found very interesting. Motter's art is decent, not on Wagner's level but is effective especially in the battle scenes. And lastly, this is the first black, white and red Grendel story ever published. It used to be quite rare, but has since been reprinted in Grendel: Black, White, and Red as well as the Hunter Rose Omnibus. Synopsis: With Argent in hiding for four months, Hunter Rose is bored. After hearing of an opportunity with a new publisher, as well as a heist deal in Gotham City, Rose decides to take up shop in Gotham as Grendel. His target is a Gotham Museum exhibit of the head of the Sphinx, but he needs to know when it will be delivered. Finding out that information will involve two roommates; Rachel King and Hillary Ferrington. Rachel is the gallery manager, while Hillary is the publisher's liaison. Grendel assumes the identity of the Riddler to try and throw Batman off, and his first target is Leonard Ross, owner of the art gallery. 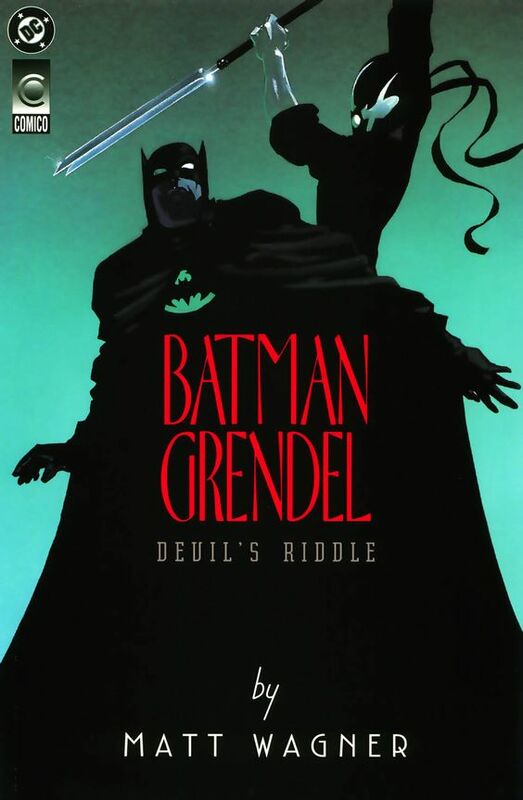 Grendel threatens Ross and is able to force him along with the plan as the Riddler, but his riddles end in declarations, not puzzles. Batman's not convinced. Hunter Rose meets Hillie at the publishing house and the two go out to dinner. It is there that Hillie reveals to Rose that her roommate is the gallery manager. Later that evening, Grendel pays a visit to Mr. Ross. Ross has not received the delivery details from Ms. King yet, but Grendel does uncover some key information: Hillie had a child that she gave up for adoption. Cornering her in a dark alley late that night, Grendel threatens to harm her adopted child unless she gets the delivery information from her roommate. Traumatized, Hillie absently wanders back home. Batman surprises Mr. Ross and discovers he'd been blackmailed all along. He uncovers the next meeting time. The next evening, Batman waits in the shadows atop a nearby building. He is ambushed from behind from his unknown adversary and falls. Batman saves himself but is not in time to save Mr. Ross, who now lies dead nearby. Through more investigating, Batman learns of the upcoming heist at a nearby warehouse. But as he crashes into the building with his Batmobile, he is tricked once again as giant dominoes fall, trapping him inside. Meanwhile, Grendel plans to pay a visit to Hillie inside her apartment, but is surprised by Commissioner Gordon and several cops in an attempted ambush. But the man they are about to face is no Riddler. The story concludes in the next issue, "Devil's Masque". Comments: Where to begin? This is one of my favorite Grendel stories. I found Grendel to be a perfect adversary for Batman. Matt Wagner's artwork and storytelling just get better and better with each book it seems. It is a real treat to see an artist grow and mature into something great, and no doubt we get to witness that in Wagner's work. Once again the presentation has changed, and there is a sense that Wagner has been inspired by his peers. 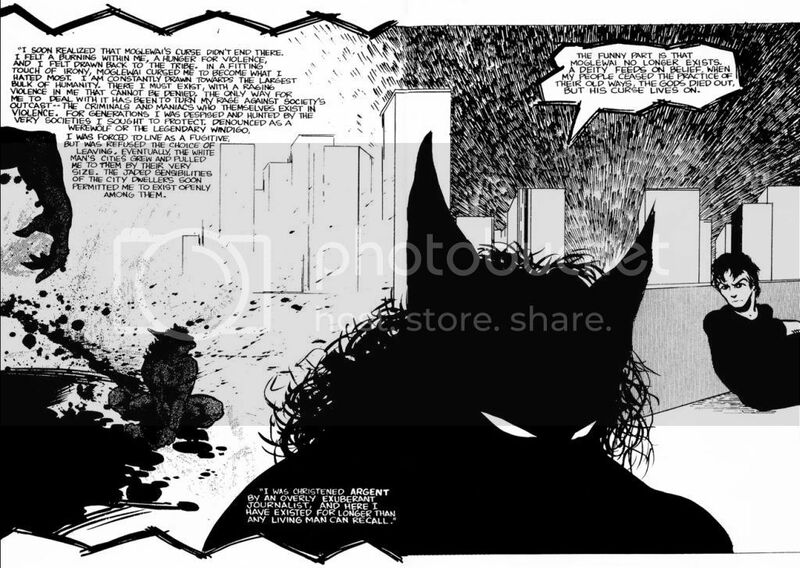 There are echoes of Frank Miller's The Dark Knight Returns as well as a similar writing structure to that of the work of Alan Moore. This is a 50-page prestige format comic filled to the brim with art and dialogue that jumps from one scene to the next at a fast pace. It all takes a while to sink in, and results in quite a long read. I re-read this over a week's period, but I imagine it would take more than an hour to read in one sitting. The story isn't perfect, and it can feel very claustrophobic at times, going into all sorts of details that may or may not pertain to the plot. I also had a hard time adapting to the fact that Hillie bought the story about the baby she gave up for adoption, and why Grendel believes he can use that information against her. It felt like a bit of a stretch to me. The roommate aspect between Rachel and Hillie is interesting and well done, and the way Hunter Rose and Bruce Wayne meet each other at the Gotham Men's Club is a nice touch. "Devil's Riddle" sets up for what will be an awesome encounter between the two in "Devil's Masque". Stay tuned.